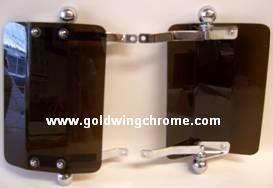 This wind deflector fits the GL1100 and GL1200 fairing trims. The sculptured smoke wind deflector features chrome mounting bracket arms. They come in pairs and have chrome adjustment knobs to re-direct air flow for both the driver and passenger. They are a very economical alternative to putting up with the elements. Requires drilling to install.